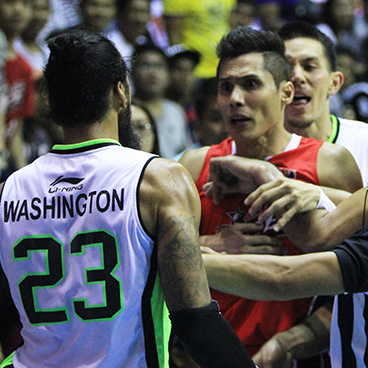 Game 2 of the the 2015-2016 PBA Philippine Cup semifinals series between GlobalPort and Alaska had an interesting twist of events as a scuffle early in the match saw no fewer than thirteen technicals handed out, with the league commissioner even getting, well, involved in the fun. It almost overshadowed the fact Alaska was able to stamp its class and square the series at one win apiece. It was, well, a very eventful evening. The Alaska Aces engaged SMART BRO PBA Philippine Cup semifinal opponent GlobalPort in a wild, physical battle in Game 2 and emerged victorious, 100-76, to draw level in the best-of-seven series on Wednesday at the SMART-Araneta Coliseum. Chris Banchero scored 18 points and grabbed 5 rebounds to lead the way in Game 2, while fellow point guards RJ Jazul and Jvee Casio also came up big, adding 17 and 13 points respectively. Calvin Abueva, who was involved in a bench-clearing incident in the first quarter, finished with a double-double of 11 points and 11 rebounds, while Sonny Thoss added 10 markers. The first half was an eventful affair that saw emotions running high, but Alaska pulled away in the second half, outscoring GlobalPort, 28-15 and 25-16, in the third and fourth periods to clinch the victory and tie the series, 1-1. Pringle led GlobalPort with 22, while Romeo finished with 20. Calvin Abueva (ALA) - 11pts, 11rebs, 3asts, 1stl. Stanley Pringle (GLO) - 22pts, 3rebs, 3asts, 2stls, 1 triple, 9/17 FGs.